Big Finish: Doctor Who THE FIRST DOCTOR BOX SET Review | Warped Factor - Words in the Key of Geek. Dr. Moo takes a look at two lost masterpieces. Imagine the thrill that writers must get if one of their scripts for a fledgling new show gets accepted and filmed and broadcast. Imagine how much more thrilling it must be if that new show goes on to be one of the biggest and most successful creations ever to exist. Imagine, in other words, getting to write for the first season of Doctor Who in 1963. Now spare a thought for poor Moris Farhi. He is a multi-award winning author, with an MBE among those awards. But back in 1963 he must have felt a bit down on his luck. Why? Because he submitted not one but two scripts to that new Doctor Who show, both of these are scripts that showed that even from the very beginning he “got” what the show was all about. And yet both of them went unmade in favour of other submissions. That must have hurt. Thankfully the scripts were not destroyed so that more than four decades later they could be brought to life and we could experience them for ourselves. Big Finish productions have given us fans so much to be thankful for over the years, and this is no exception. You’ve probably guessed by now that I am going to be very positive about both of these stories, so let’s stop wasting time and take a look at why. Up first we have a pure historical adventure, and one that is probably better than all, or at least most, of the pure historicals that the show would actually make. The setting of the story is in Babylon during the visit to the city of Alexander The Great, king of Macedon, on the days leading up to his death. The story sees the Doctor, Ian, Barbara, and Susan caught up in his inner circle befriending him. And then the murders start to happen. This is because there are four conspirators who want to put one of their number on the throne once the king is dead, so they set out to bump off the three men he has named as possible successors. The modes of death are wonderfully gruesome too. One gets into a drunken sword-fight, one gets poisoned and commits suicide rather than give in to the sickness, and the third, in a wonderfully-realised scene thanks to some trippy direction by the multi-talented Lisa Bowerman, gets knocked out and wakes up with an asp on his chest which he fights off as he has to struggle through some gardens with his killers chasing him as he makes his way to the Doctor. That scene is intense; I can’t really do it justice. There are lots of moments that will stick with you after any good Big Finish release, and this story has several, but that is easily the most memorable one. It’s not long before the TARDIS travelers are chosen as scapegoats by the true killers and are forced to prove their innocence. The Doctor is delightful here, forced to walk over hot embers he chooses to prance back and forth over them just to show off. That’s the First Doctor right there, yes, perfect! Ian has to take part in one of the victim’s funeral games, in an edge of your seat sequence drawn out over the last couple episodes in scenes that are almost identically recreated in “The Romans” a season after this was to be made. Running at six episodes it could feel like the story is drawn out longer than it should be, but it never comes across like that. The script is incredibly tight and focused so that there’s never a dull moment. I even found myself listening to parts three through to six in one go, which I was not intending to do, simply vecaue it’s so well-written and performed. You can’t stop yourself listening to this one once it gets going. And I think we can agree that for a six-parter this is a rarity! What makes this even more impressive is that there are only three members of the cast. 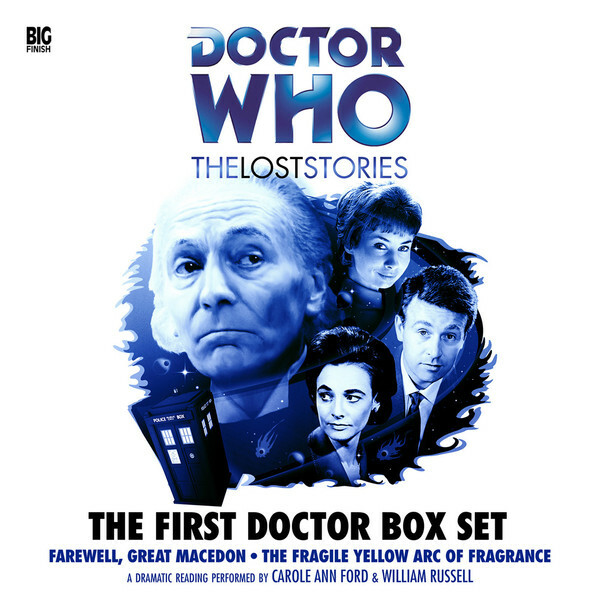 William Russell does double duty as the Doctor and Ian, Carole Ford does the same for Susan and Barbara, and John Dorney trades in his usual writing credit to perform as Alexander. Dorney is one of the best writers Big Finish have at the moment but he’s only in an acting role here, and yet he steals the show. He plays the role with such emotion and conviction, every scene he’s in is a joy to hear. That’s not to take away from the achievements of Russell & Ford however. As well as each playing two different TARDIS crew members (and they each make them both sound different so you never mistake which character they are at a given moment) they also have narration duty. They have to play every single character bar the one Dorney plays. And somehow they manage to carry three and a half hours of audio on that basis without it ever feeling dull or repetitive, and you never find yourself confused and asking which character said that or to whom they said it. I can’t praise these two enough for carrying this off! The second story is the weaker of the two, but that’s always gonna be the case when you’re up against something as good as “Farewell, Great Macedon” was. This story is still something special. This story is unusual in many many ways, so you can kind of see why it was never made. 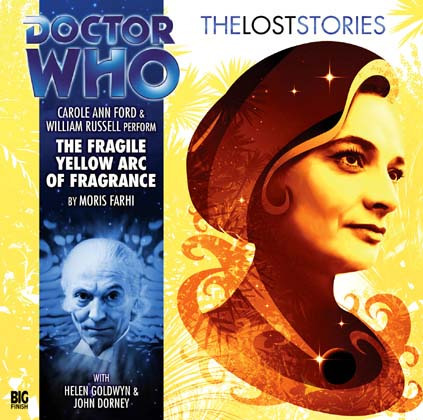 It’s only one episode long, and it’s set after the adventures are over and instead depicts a TARDIS crew having to say goodbye to the friends they’ve made during their trip to the planet Fragrance. Its plot is a weird one, but that’s part of why it works. It comes in two halves, one each for the Doctor and Barbara. The Doctor gets to show a couple of aliens around the TARDIS, which is very unusual for the 1st Doctor to do. Fair play to them, they make a point of noting how unusual this is. Ian’s disbelief is especially big. This part of the plot goes on a bit too long, but it has a purpose: Keep the Doctor and Ian out of Barbara’s way. And it is nice to get a good look at how the TARDIS works, so I won’t complain! Barbara meanwhile is facing a much trickier dilemma. One of the natives of the planet has fallen for her. And as his sisters explain to Susan, if you fall in love on Fragrance then that’s it for life. You can’t fall in love a second time and can’t live out your days alone. If Barbara leaves then this man has to go the afterlife. And of course Barbara doesn’t want to stay. But now she wants to, for him. She has to weigh up her options and she eventually decides to stay behind. Just as she goes to leave the TARDIS, the Doctor flips the controls and off they go, amid Barbara’s protests (although you do get the feeling she’s glad to not have to make the choice herself). The 1st Doctor is a less polite person than his later selves, but he cares for his friends more than he does for himself. He’s prepared to take on the responsibility, instead of Barbara it’s his own fault that the man has to die because this way Barbara stays with the Doctor, Ian and Susan. It’s a really hard-hitting ending, and one of the best moments ever for showing off the Doctor’s complex morality. And I love it! The story itself isn’t particularly exciting but it captures the strong character-driven drama that defines Doctor Who in its first couple seasons and that’s why it works. You can see why they didn’t make this one, thanks to its unconventional format, the fact it’s set after the adventure is over, and of course the spot of suicide that ends it. That’s a shame. I think this should have been made anyway. It feels very modern really, ahead of its time almost. At 35 minutes you could blow the dust off of the script, add in an extra ten minutes at the start (Maybe a really quick sequence where some monster is defeated?) and then you just replace Barbara with Rose, Martha, Donna, Amy, Clara, or Bill, and with that you’ve got yourself a modern episode. Or if you were to trim 5-10 minutes off of it (Maybe the bits when the Doctor shows people round the TARDIS?) and you’ve got yourself a one-episode story to add to the first season, and that can easily be worked in by trimming an episode off of something like “The Dead Planet” (which is very good but honestly has no reason to be seven episodes long). And if you were to remove “The Reign of Terror” and insert “Farewell, Great Macedon” then suddenly season one improves immensely. That’s the thing you see, these stories really should have both been made. There’s easily room within that first season if you trim away the fat. If I had access to a TARDIS of my own then you can be sure I’d drop in on Verity Lambert and have her make those changes. These stories deserve to be told, and I cannot thank the guys at Big Finish enough for seeing to it that they were brought to life. What more do you want me to say? 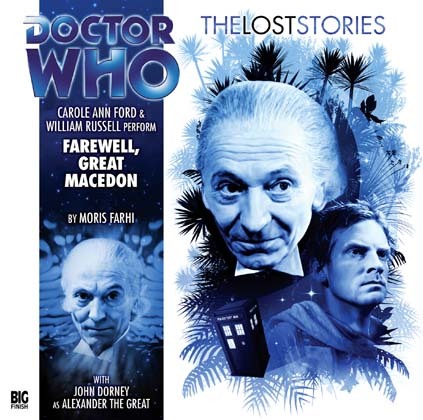 If you want more from the First Doctor and want to experience some of the greatest scripts ever written for him then this box-set comes highly recommended!